As a vegetarian for nearly 10 years (wait- whaaaa?! ), I have been through protein “phases”. When I first started out, I had no clue whatsoever about nutrition, and definitely knew nothing about healthful vegetarian protein sources. A child of the processed-foods ’90s, in my early veg days, I would arrive home from school, make a bag or box of noodles with a powdered sauce (Fettucine Alfredo Pasta Roni, anyone? ), and proceed to eat the entire pot. Okay, I was in eighth grade, so let’s take that into context, but still. I went on like this for a year or so, consuming plentiful processed foods, while in the meantime, slowly learning to cook my own food. My mother told me, as soon as I became vegetarian, that she would not be cooking separate meals for me. Hence, I needed to learn how to cook. Honestly, I was not upset about this necessity. I had always done a fair share of baking, and I enjoyed sitting at the counter, watching my mom make her famous marinara sauce (she makes about 4 gallons of the stuff! 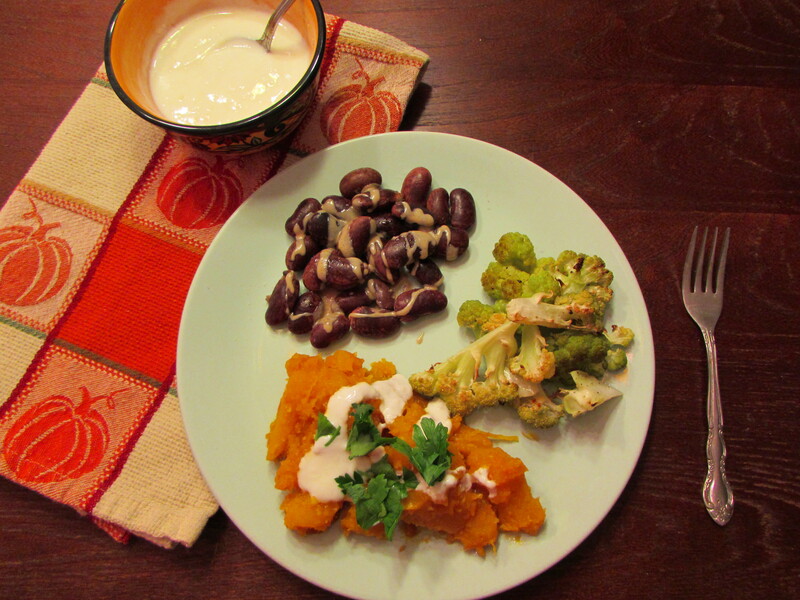 ), and her classic mashed sweet potatoes with peppercorn chicken. So learn how to cook I did. It was not a fast process by any means, and while it was happening, I really had no awareness of it. It is only now, when I look back on my early cookbooks and remember how impossibly difficult I used to think the recipes were, I realize I did “learn” how to cook. After making some delicious dishes, some not-so-tasty disasters, and following hundreds of recipes, I’m proud to say I can now can scan a recipe and know exactly what part each item plays before I even read the directions, and based on that knowledge, I can create my own recipes (which is why I have this little blog, but of course). While I was learning to cook, I was also becoming more knowledgeable about health. And it was during this time that I became more aware of vegetarian protein needs. Processed soy foods, here I came! I started buying Morningstar Farms fake chicken patties, veggie beef patties, sausage, and of course, Tofurkey deli slices. I made sure I ate one of these items with every lunch and dinner. Sometimes I ate beans, but not that often. I was all about the fake meat. I went on like that for a good 5 years or so, until I got to my middle years of college and became a fangirl of Angela Liddon’s website, Oh She Glows (which I am still a huge fangirl of, by the way!). She taught me about being a whole-foods vegetarian, and I drooled over all of her legume-centric meals, which looked much tastier than my processed chik’n patties with more ingredients than I dare to count. I weaned myself into only buying one box of soy beef or chicken strips per week for a year or so, and now I never buy them, instead opting for the occasional tofu or tempeh. So what do I eat the majority of time, you may be wondering? Yes, beans, beans, the magical fruit…and well, you know how the ending goes. That is probably one of the first comments I get when I relay to people what my main protein source is. They probably think I ride around on a little chariot of gas all day. But really, I do not. Once you begin consuming beans on a regular basis, your gastrointestinal system will become accustomed to the fiber and carbohydrate load contained within them, allowing you and everyone else you are around to smell the roses again. But that song is not wrong- beans really are magical. They are packed with crazy amounts of fiber (9 g or 35% of your daily intake in one ~1/2 cup serving), protein (6-9 g), folate, manganese, magnesium, phosphorus, iron, copper, and potassium. Woah, that there’s a vitamin shop right in your pantry! Also, in case you’re wondering, the reasons I eat dried over canned beans are that canned beans often contain preservatives, and dried beans are much cheaper. Organic canned beans are my go-to for a quick, healthy dinner, though, if I don’t have any cooked beans in the freezer. Trader Joe’s sells some that have an ingredient list to my liking: “Black beans, water, salt”. 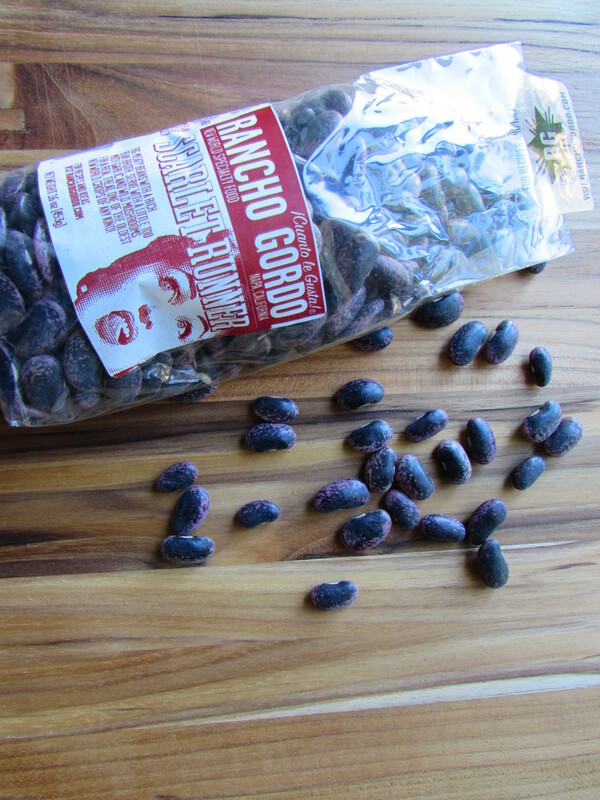 I chose to demonstrate how to make beans for you all with some of the most beautiful beans I could find, Rancho Gordo’s Scarlet Runner Beans. Aside from Oh She Glows, I am also a huge fangirl of Rancho Gordo. Anyone who has ever talked to me about beans will sadly know this, and proceed to remember the conversation where I waxed on about the virtues of heirloom bean agriculture for a solid 15 minutes. But, I digress. I shall save that tome for another post. 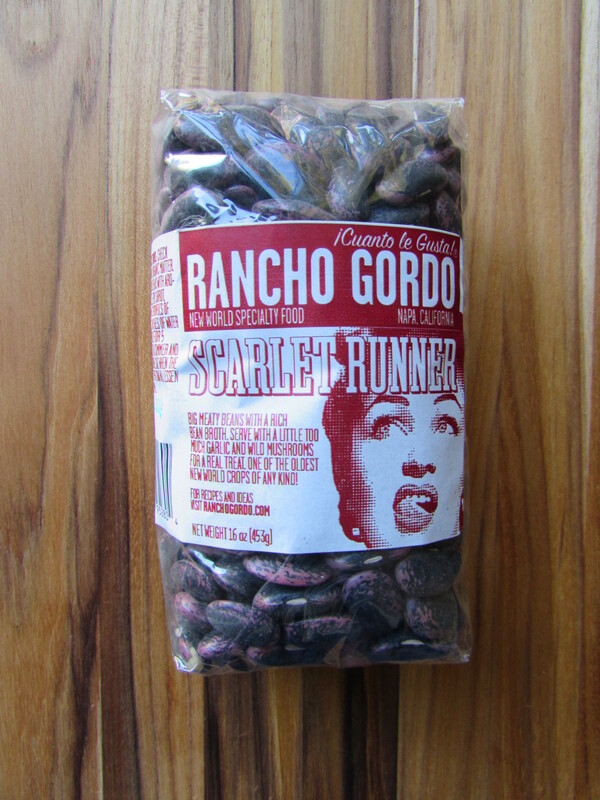 Anyway, Rancho Gordo beans are by no means cheap, but they are hands-down the best tasting beans I have ever had. It doesn’t hurt that they’re also the most beautiful. Your first step in making homemade beans is sorting and washing the beans. I usually measure out 2 cups of dried beans, which produces 10-11 servings of beans, or about 3 cans worth. I then sort through them and pick out any gnarly ones or rocks that may have meandered into there. 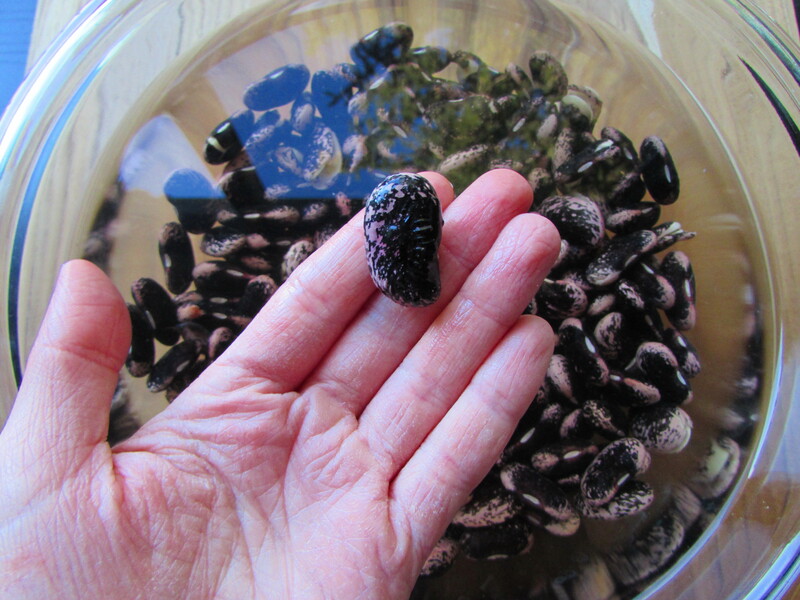 Then, I dump them in a strainer and wash them with water for a few seconds. I add the beans to a bowl with 7-8 cups of water. 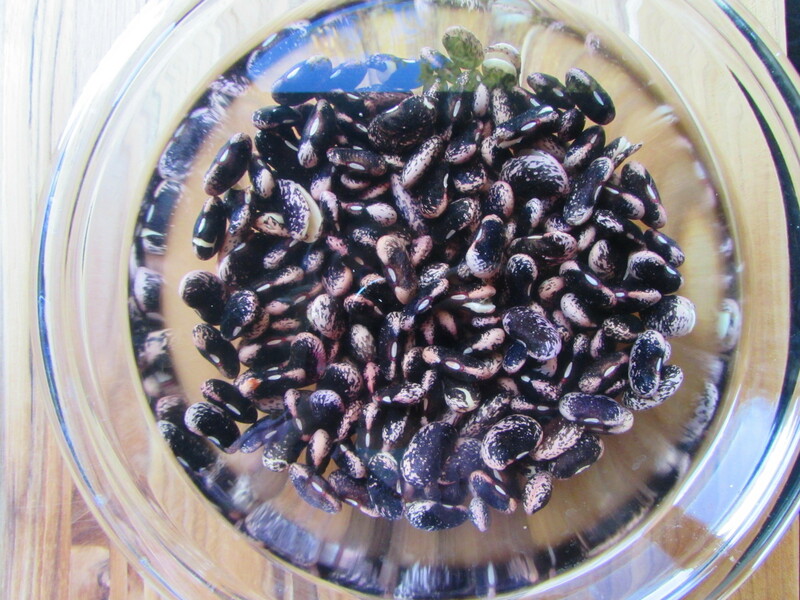 The picture above is beans that were soaking for under 10 minutes. If you are feeling fancy, you can also add some onion, garlic, herbs, or kombu to the cooking pot with the beans. Kombu is a type of seaweed that lends an umami flavor whatever it is cooked with. But, if you’re like me, most of the time you’re lazy, and plain beans taste pretty darn good. 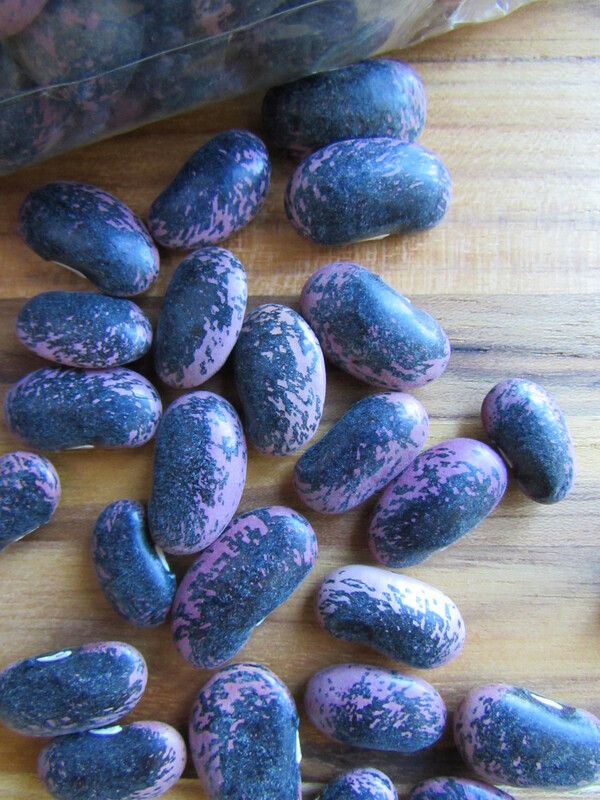 Sort the beans and pick out any rocks or gnarly-looking ones. Rinse them in a colander. Add to a large bowl and cover with 7-8 cups of water. Let soak overnight, or up to 24 hours. 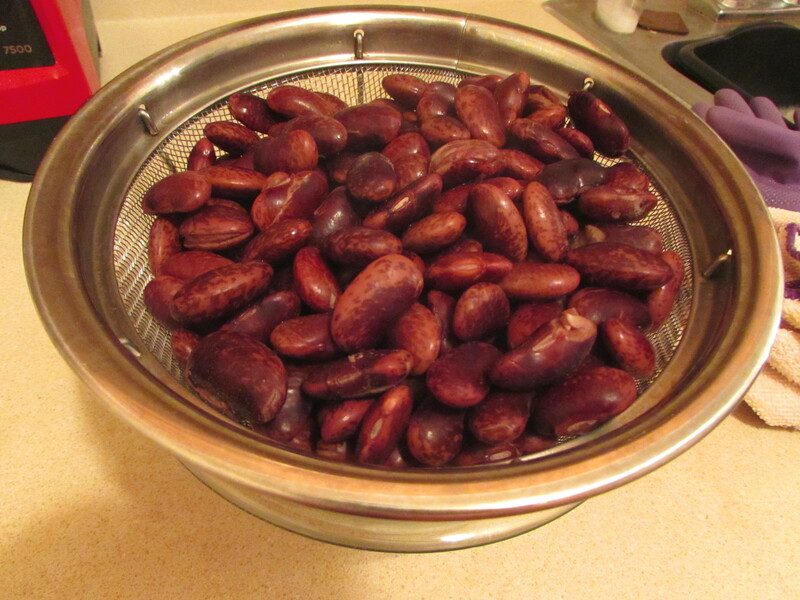 Drain beans in colander. 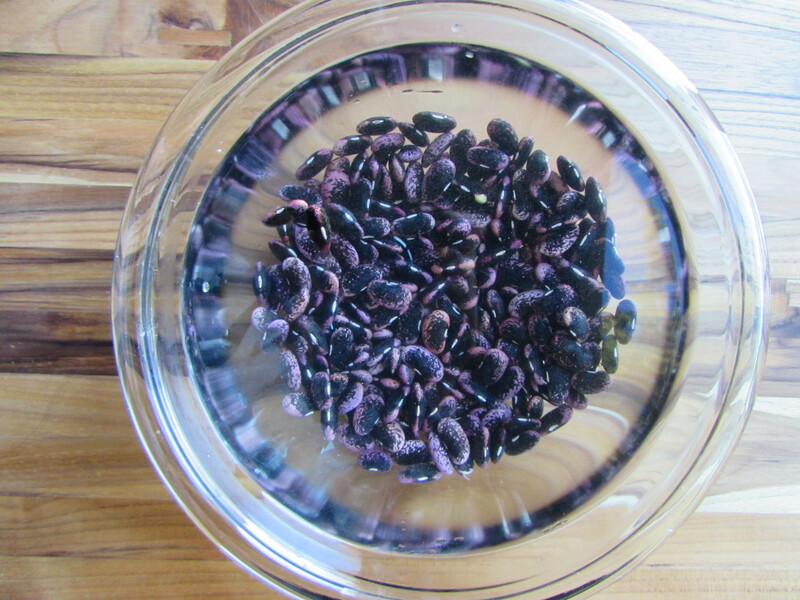 Add beans to a large pot and cover with another 7-8 cups of water. Do not add any salt! Salt prevents the beans from cooking. Cover and bring to a boil (see note). Simmer for 1 hour, or until beans are soft when tasted. Chow down! Notes: 1) When cooking red kidney beans, make sure to boil for 10 minutes to cook out a natural toxin contained within them. 2) I freeze my beans in 1-can amounts for easy meals later. Frozen beans have been a lifesaver for me and revolutionized the way I cook and eat. I enjoyed these scarlet runner beauts with my Borani Kadoo, and some roasted green cauliflower. They were also divine with some crushed garlic and olive oil, scooped up by a crusty piece of bread.